You’ve heard lots of stories about diet and acne but you aren’t sure whether they are myths. Right? Well, acne problem is widespread. Their conspicuous nature stirs creativity as people try their best to eliminate them. However, you should never turn your skin into an experimental tool by trying out every product that you hear about from friends. In the recent past, a debate about the contribution of diet to the emergence or worsening of acne has been rife. Numerous research studies have been conducted to determine the link between diet and acne development. One research conducted on the relationship of diet and acne showed that a low glycemic diet is ideal for preventing acne emergence and quickening the healing process if you’re already struggling with the condition. Acne and Diet: What is the Relationship? While diet regulation has worked for many people, very rarely will any of them fathom how it works! One of the leading causes of acne is hormonal variation. Anything that leads to the variation will lead to acne. But how does food lead to hormonal variations? Well, high glycemic diet triggers overproduction of insulin while those with low glycemic index ensure that only enough insulin is produced to maintain blood glucose levels within the normal range. Clinical evidence shows that foods that lead to a high release of insulin lead to acne. The insulin increases the production of androgen which in turn raises the amount of sebum produced by your sebaceous glands. As a result, the skin pores may be blocked leading to infection and inflammation which present as an acne on your skin. Based on the above information, it is crucial that you evaluate your diet and determine whether it could be the cause of your acne. We recommend that you systematically withdraw from high glycemic load food and observe whether your skin will portray a positive change. Carbohydrates are the foods that provide your body with glucose necessary for energy production. As such, it is highly important that you ensure enough supply of carbohydrates to fuel your body mechanisms and provide you with the energy to undertake your daily activities. However, too much carbohydrate can be harmful! High sugar levels in your body upset the hormone balance which leads to acne and other health complications. You should, therefore, ensure that you only consume the right quality and quantity of carbohydrates. 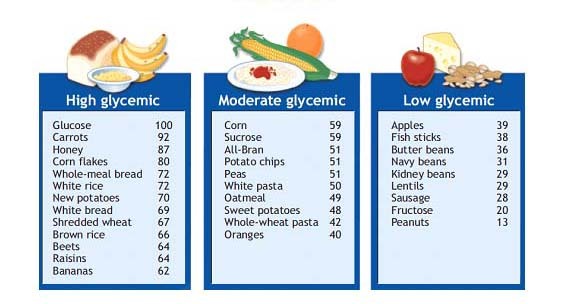 Glycemic index shows the agility with which the food you ingest is digested and absorbed into the bloodstream. The glycemic load of an apple is obtained by multiplying its GI (38) with the amount of average carbohydrate level (13 grams) and dividing by 100 to give a figure of 5. On the other hand, a potato has a GL of 12 making it have twice as high GL as an apple. The GL of a mixed food is obtained by adding up the GL values of respective ingredients. 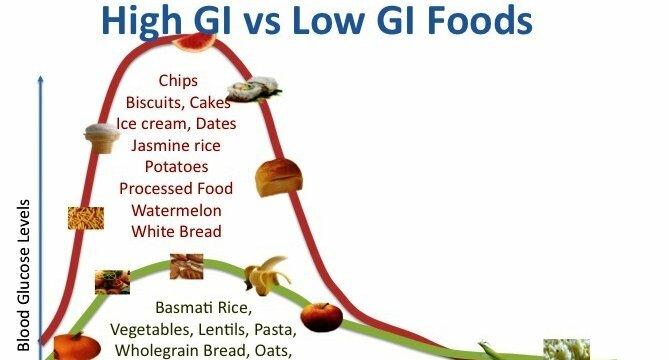 Some of the foods with high GL include candy, white pasta, sweetened juices, white rice, French fries, low-fiber cereals, and baked potatoes. 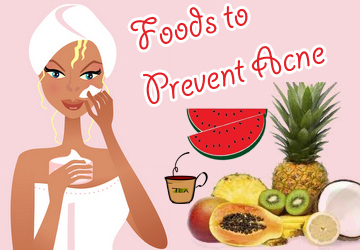 If you want to win the fight against acne, then you should consider avoiding these foods! If you’ve been frustrated by acne on your skin, you need to take critical decisions to accelerate the healing process. 1. High Glycemic Carbohydrates. Just like we’ve discussed herein, these foods spike the level of insulin in the blood leading to hormonal upset and consequently to acne. The foods include French fries, baked potatoes, candies, and other sugary substances. 2. Omega-6 Fats. These foods are linked to inflammation and they could just be the reason you’ve not succeeded in fighting those stubborn pimples on your skin. We recommend that you cut down on foods rich in omega 6 fats and increase your consumption of omega-3 fats. Some of the foods rich in omega-6 include eggs, wheat, poultry, and cereals. However, it is important to note that you can mitigate the inflammatory properties of these fats by striking a balance with omega 3 fats. 3. Dairy Products. These foods are associated with acne since they increase the level of insulin in the body leading to the overproduction of sebum. As a result, your skin pores are likely to get blocked which will encourage the development of acne. Also, the products accelerate inflammation which worsens the condition if you’re already suffering from acne. If you like milk and other dairy substances, you should consider taking a break from them and observe whether the condition will improve significantly. 4. Candy and Milk Chocolates. The question of whether chocolate can lead to acne has raised controversy for long. However, you should note that not all forms of chocolates are healthy. As such, it is critical that you avoid sugary chocolate since they have a significant potential to aggravate your acne problem. If you must eat chocolate, we recommend that you take dark chocolate which has immense health benefits. Milk chocolate and candy has a high glycemic load and thus contributes significantly to the increase of insulin and consequently exacerbate your problem. 5. Foods Rich in Saturated Fats. You can obtain these fats from margarine, processed snacks, baked, and fried foods. The food substances are linked to increased inflammation which has the potential to cause acne. As such, you should avoid saturated and trans-fats if you desire to restore the glow of your skin. 6. Whey Protein Powder. Yes, there is a substantial relationship between this diet and acne. If you are fond of using it, then you will need to regulate its use if you want to eliminate your acne completely. They are rich in leucine and glutamine amino acids which are known to enhance the growth and division of skin cells. If you consume it in large amounts, you will experience the development of acne on the skin. Also, this product is believed to lead to an increase in insulin production which is linked to the development of acne. 7. Gluten Rich Food. 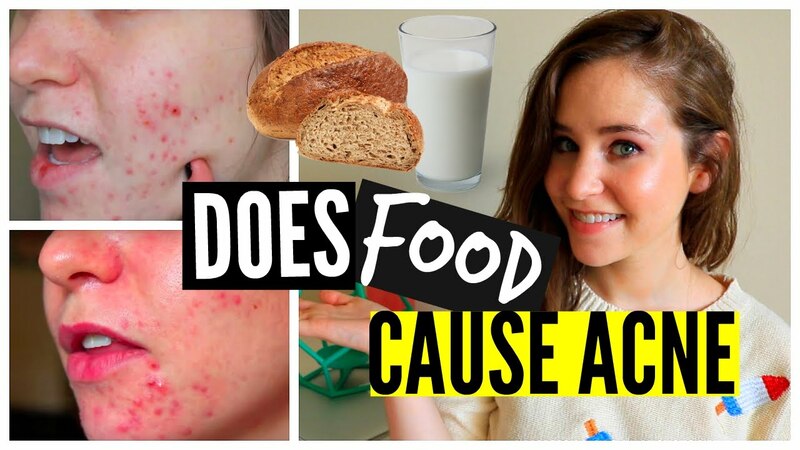 Wheat and other foods rich in gluten cause inflammation which will either result in acne development or complicate your efforts to fight the already existing acne. Worse still, the gluten-rich food can easily deplete antioxidants which further makes the problem complex. If you want to win the acne battle, then you have no option but to avoid taking too much gluten! There are some drinks that will definitely complicate your effort to eradicate acne. You should avoid drinks such as alcohol, coffee, and soda. 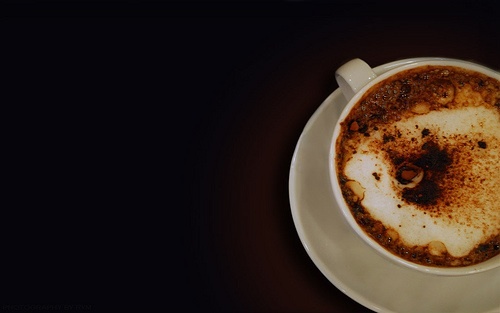 Alcohol and caffeine create hormonal imbalances which result in acne. Also, alcohol can suppress your immune system thus exposing your skin to the risk of developing acne in the presence of other inducers. On the other hand, soda contains high sugar level which spikes the blood glucose levels. When the sugar level rises, the body responds by producing more insulin which is linked to the development of acne. What should I eat to Avoid Acne? Probiotic Rich Food. A healthy gastrointestinal tract will translate to an acne-free skin. As such you should embrace yogurt, kefir, sauerkraut, tempeh, kimchi, miso, and pickles. Omega 3 Fatty Acids. These foods have an anti-inflammatory property and their consumption reduces the probability of acne development. These foods include nuts and fish. Foods Rich in Zinc and Vitamin A, D, and E. These nutrients and minerals will boost your immunity and prevent the development of acne. Also, they play a crucial role in skin regeneration thus ensuring that your skin is free of dead skin and that the pores are always open. Green Tea. This is one of the products you should never miss in your kitchen if you’re serious with the acne eradication battle. It is rich in polyphenols that are effective in reducing inflammation. Also, this product lowers the sebum produced by sebaceous glands thus eliminating the possibility of pore blockage. It will help to prevent as well as treat existing acne! You should remember that the real threat to your skin’s health is high glycemic diet. As such, we recommend that you moderate the consumption of carbohydrates foods to reduce the amount of sugar in the blood and consequently regulate the insulin in your system. This will significantly boost your elimination efforts! Also, you should ensure that you drink a minimum of 8 glasses of water daily. This practice will keep your skin hydrated which is necessary for fighting acne. ← Soap for Skin Cleaning: Is it Healthy? I did not know about this, so it’s really interesting with these new findings that have caused acne. Hello Jullvaglobal……Choosing the right diet is the first step to realizing a flawless skin. Now that you are in the know, make sure that you eat right. It will not only help you with the skin but it’ll have a holistic effect on your health too! I’ve always known that what you eat affects your skin, but had no idea that there were foods to clear it up too! There are plenty of home remedies that you can use to eradicate acne at home. Diet is the most fundamental of all of them. Choose the right diet and bid goodbye to acne! Very informative post. I didn’t know about GL. Acne are a big problem for teenagers, this post will definitely help them in getting lesser of those. Avoiding diet with a high GL is fundamental in curbing acne. We endeavor to give you more helpful information on the topic. Very useful.and informative article…one got to be careful while selecting diet.. Interesting to know some things less known that causes acne. Thank you! I have completely given up desserts and boy what a difference it has made to my health and skin! Nicely written blog! Hello Devyanl Ray. Congratulations on your achievement. I am happy to hear that you realized the secret to resolving acne successfully. Now continue with the trend for an even more flawless skin! I used to have serious problem with acne but when I moved here in United States never had any problem anymore. My diet is the same and never really liked sugar and sweets. I guess there are just so many factors why some people have serious problems with acne. Hello Nina. The emergence of acne on our skin has myriad reasons. It’s factual that diet is one of the main contributors. However, there are other causes of acne including hormonal variations, use of inappropriate comedogenic products, genetics, allergic reactions to different substances, failure to exfoliate the skin to remove dead cells, among many other factors. I will be highlighting them in this forum and you’ll identify with the factors that could have led to the acne then. You can also read What Causes Acne? for more insight. Thank you for following the discussion! It looks like a good diet in general will help prevent acne. Too bad I like so many of the bad foods. Yes Jared, it’s paramount that you filter your diet. Besides acne, poor diet is a precursor of many other illnesses. Eat right to live healthy! You are absolutely right. Foods high in carbs, fat, and oil ate triggers for acne. People who are acne prone need to moderate these foodstuffs! I am one of the lucky ones who has never had acne in my life. Though if I eat too oily food then i do get a small boil on my face. Too list to avoid food for acne. Wow, you’re lucky Ketki. Now that you know that oily foods result in the boil, you need to take such foods with moderation. All the best! Nutrition is so important for the skin, we are what we eat! I don’t know that protein cause acne. I’m on diet now I’m eating some fruits and vegetables. Thanks for sharing your idea. great article from you. Thank you for finding time to comment. It is a good thing you are on diet. Yes, there has been extensive research that tend to prove that whey protein causes acne. One of the research you may read through is Acne located on the trunk, whey protein supplementation: Is there any association?. Also, you ensure that you take plenty of water and exercise regularly as elucidated in this article 5 Natural Tips that Help to Eliminate Acne Completely. All the best! Now I know why I was plagued with acne when I was in highschool. great article. Thanks for sharing. Great info. I have heard so much about dairy (specially non-organic) causing acne because of all the hormones in it. Thanks for sharing. Fantastic and informative read – I am currently suffering from Acne and it really is disheartening. I’ll be able to take what you’ve written into account now and hopefully I will start seeing some changes!